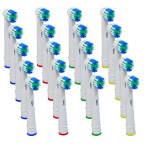 Oral B Toothbrush Heads | Are Compatible Brands just as Good? The generic brand of Oral B toothbrush heads come in a generic package. No surprise there! Will I miss the pretty, Oral-B logo on the package? No … I wont. Nor, will I miss paying 6-times too much for a toothbrush. The generic toothbrush heads felt just as sturdy and well made and fit precisely the way they should on my toothbrush. Honestly, I cannot say that they are 100% identical. If there is one, very, very subtle difference it is that the compatible toothbrush heads feel just a wee bit smaller. After using it a couple of times I could no longer even tell the difference in size. After a month, I’m already on my 2nd replacement without feeling the guilt, shame or worry of wasting $5.00 a moment too soon. For $.75 cents each I will change my brush as often as I want! One another nice little fringe benefit of these generic toothbrushes is the way they are packaged. They are divided up in to 5 – 4-piece packages which makes them very convenient to handle, store, or take on the go! The verdict is that these Oral B compatible toothbrush heads are virtually the same thing for a fraction of the price.